This 13 3/4" x 9 3/4" bright white cake pad is grease proof and made of corrugated cardboard to ensure that even the heaviest cakes can be properly supported and carried. These cake pads are coated on top, and do not show grease stains or let the grease leak into or through the cardboard like other cake pads. We use these boards daily inside of our cake boxes to hold cakes and cupcakes. The grease proof is nice and we don't have to worry about grease when we serve our customers. Awesome. These boards are very sturdy. They give my cakes the support they need. Sometimes I tape 2 or 3 together and make cake drums. The quality of these cake pads are good but the are a bit smaller than others I gave purchased. I use them when I make ice cream cakes and the cake comes to the very end of the pad which makes it difficult to pick up. These pads are completely grease proof. I have used them many times for cakes and they work very well. I will be buying these again. I will ALWAYS buy these. These are the best sheet cake pads that I've found so far. They fit perfectly in the quarter sheet cake boxes. They are sturdy enough for my cakes (which are very dense and heavy). If I ever need an even more sturdy board, I just double these up and wrap them in foil. These are grease-proof, which I love, and I've never had a problem with any spotting. I would definitely recommend. These quarter sheet cake boards are great! I like that they are grease proof. It makes decorating a breeze to wipe of the frosting. You get a good amount for a very affordable price. You can't go wrong with a grease proof board. For years i bought cake boards from my local supplier that were not grease proof and would cover them with foil. this is a life saver. I use them for my quart sheet cakes and them stick them to a gold cake board. Great quality and price. Greaseproof boards are so important. I never buy any boards that are not greaseproof. These are a great find and a great bulk buy. These boards are truly grease proof. I have used a wet cloth to clean up the edges, and they don't seem effected at all. Tape two or three of these boards together and it makes for a very strong cake board. I will continue to purchase these cake pads. I have a smaller home business, so I have bought these for my smaller cakes round, square and sheet cakes. I also put them on the bottom of my cupcakes when I use the 14" x 10" x 6 1/2" White Quarter Sheet Window Cake box. These have been great for my business. Love that these are grease proof and make icing a cake a breeze. Excess icing can easily be wiped off the board for clean presentation. While I do wish these boards had sharper corners, instead of the rounder ones, this is still a great deal for 100 boards. We use them for cakes and in shipping boxes for cookies. I have been using these cake boards for years and absolutely LOVE them. They are sturdy, I love the waxed/greaseproof top. They fit perfectly in the boxes that I also get from here! These 1/4 sheet pads are great not only for cake, but provide a solid base inside the box for brownies, cinnamon rolls and cupcakes. I'll buy again. Good quality. Provides good support for my cakes inside of the quarter sheet window bakery box that I bought. I will be ordering these again. These work awesome. We make a lot of cakes and helps save us a lot of money as well compared to the gold bottom ones. Just have to be careful and not get the white part wet. If so it may stick to the cake. I've been using these cake boards for years now. I love them they work great and nothing sticks to them plus they are very sturdy. Love the quality of these corrugated board perfect for quarter sheet cake. They wipe easy without staining the board from the buttercream icing. They are worth the buy. I am so pleased with quality of these cake boards and the price is a great benefit as well. I would highly recommend to anyone who asks. These cake boards are a staple in our bakery. They add support to our cakes and make them easy to transfer from place to place. This is the perfect size for a standard sheet cake. These cake boards are a tremendous asset to my business. They look very nice and are sturdy enough for heavy cakes. Will definitely purchase again. At this price, these cake boards are an excellent value. However, I do wish they were a bit sturdier, as they often bend under the pressure of the cake. I love how sturdy this cake pad is. I recently make cupcake on the board as a floral bouquet on Valentine and everyone love it. These are standard size for a half sheet cake. There is room for a thick boarder plus extra on the edge. They don't absorb grease. This is a great item provide the perfect place for our custom cakes and special orders. Always gives a very professional look and nice finish. I love this board. Very steady And can handle a lot of weight from my cakes. It fits perfectly in the corresponding box too and is grease proof. These grease resistant pads are perfect for 1/4 sheet cakes or assorted pastries. It fits perfectly into the 14 x 10 x 4 quarter sheet cake box. And the grease resistant coating means that there aren't ugly grease spots on the pad or the bottom of the box. I have ordered these a few times now and I am very happy with the quality and the price. They work great in the standard 1/4 sheet cake boxes. Be sure to put a bit of buttercream on the bottom of your cake so it does not go sliding though. The grease-resistant coating makes it a bit slippery on some types of cakes. Great quality grease-proof cake boards. I use these all the time for quarter-sheet cakes. The cardboard is very sturdy, you do not need to double the board. Purchased to provide support and line my Sheet Cake/Bakery Boxes. The underside is Kraft Brown so just know that you can use either side to help support the box, although the grease resistant side is the white side. I lined the Cake/Bakery boxes this Holiday Season with this cake pad to provide support for a ton of cookies and brownies and they worked out great. I happened to notice a similar product at a national craft supply store where 3 cake pads cost almost as much as what I got for 100 from WebRestaurantStore. I recently made several 13x9-inch sheet cakes, and again this product did the trick. Allowed me to easily frost the cake, and then set inside of the Sheet Cake/Bakery box for a perfect fit. Everyone was asking where I purchased. I am very pleased with the quality of these cake boards. I was unsure of the quality because of the price, but really wanted to order them because the local store marks these up so high. They don't disappoint. They are a great product and I save a lot of money. Exactly as expected. Great price compared to purchasing at the local hobby / craft store. Will continue to purchase these for all of our sheet cakes. This cake board is the perfect size for a 9x13 size cake! Will definately be purchasing again in the future! Very impressed with this item! Very durable! Great quality and price. The grease proof boards are the way to go. They provide a nice finish and they do not get flimsy from the frosting. Another first quality product at the right price. I check the web for deals and these are at the right price. Nice thickness and great for a professional bakery. Very sturdy. I make cakes for family members on the side and it is much easier not having to move the cake. Just decorate straight on the board. LOVE IT. Good product and good price. These white cake pads are sturdy enough to hold the cake secure when I move the cake into the box. Easy to wipe off extra frosting and keep a clean appearance. The board is very sturdy and stacks well when used with multiple tiers. I couldn't find a better price. These boards are great! The perfect fit. They are thick enough to be sturdy under my heaviest cakes. With the rounded corners the board doesn't need to be cut to hide it. The grease proof cake boards are the best. When in a hurry you don't even need to cover them. Just place your cake on them and no grease spots at all. The size is good for a lot of different shapes. i really liked these boxes because they are grease proof. They were not as thick as I have used in the past, but I could have ordered the wrong item. These cake pads are great. They are exactly as they are described. Very heavy and perfectly sized. You will have no worries as to whether or not they are truly grease proof, trust me they are! 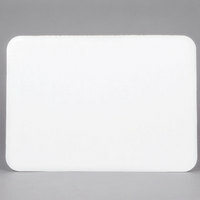 We use this cake pad for our catering services. This pad is great quality and is fairly inexpensive, a win win. Highly recommend for bakeries or catering services. These are nice cake boards and at such a great price! We use them for all sorts of things besides cakes...cupcakes, brownies, cookies. Used in conjunction with boxes, they add strength and stability. Love, love, love these 1/4 sheet boards, they are well coated, very sturdy & hold up very well. Shipping was very fast and packaged really good too! Will be on my reorder list for sure. Use these for our small sheet cakes, fit well into the boxes actually purchased for cupcakes!! Great price, good quality!! Will continue to purchase this product!! I really like these 14"x10" corrugated grease resistant white cake pads, It's perfect for 1/4 sheet cake, 1 dozen cupcake and 1/4 sheet cookie cake too. These cake boards with great for small 1/4 sheet cakes and look beautifully with the addition of silver or gold foils, or whatever paper you may want to add for decoration. It's hard to show how these work in a photo, but they give the cake box so much support. They are perfect for my business. These quarter sheet boards are great. At first we were concerned about the rounded edges, but now this is our go to board. Excellent price, excellent product and they are grease proof! The grease proof feature works perfectly. These boards can handle the weight of multiple layers and still not bend. I’m impressed that these pads arrived without a dent and fit perfectly in the quarter sheet boxes. These pads are great, i really like the fact that you can easily put them together to make them a little bigger. My cupcakes and cupcake cakes fit nicely on them! This quarter sheet board is perfect for displaying and supporting elaborate custom cake work. We like decorating the board with various coordinating elements, and it holds fondant and frosting well without getting greasy or flimsy. I love these grease proof cake pads. They are sturdy enough to hold heavier cakes. Grease from the icing does not bleed into the board. My end product looks professional. This cake base is the perfect size for your quarter sheet cakes. It is sturdy and reliable. I love that it has that coating on top that protects the base from the frosting grease. You'll never go wrong with this cake base. And it fits perfectly with the quarter sheet box. These cake boards are definitely grease proof. They are very sturdy. I load my cupcakes with frosting, without these cake boards my boxes would definitely colapse in. Love the fact that they are white. They give a great presentation when delivering my cupcakes to customers. It gives them a clean look! Will buy more soon. I HAVE USED THESE FOR CAKES AND HAVE CUT THEM IN HALF FOR SMALL ONES, THEY DISPLAY THEM REALLY WELL. THE ROUND EDGE IS ESPECIALLY NICE SO YOU DON'T HAVE TO CUT THEM AS I HAVE FOR OTHERS. We use these for our cinnamon roll orders (bulk) and our customers love them. Very sturdy and soak proof, great product at a great price! These boards are so expensive in New York City. Where I can buy only a few at a time with the webstaurant site I can buy an entire case for the price of a few in the local bakery supply store. I love these boards they are thicker then the ones from the craft store, the box they are shipped in is perfect to keep them from getting damaged. They work great with the boxes I ordered and the price is amazing!! will be ordering again! Sturdy board to put under cakes. We ordered boxes to coordinate and it's a great match to put the cake in and know the customer won't have any issues getting the cake home. This cake board is very sturdy and holds up even after refrigeration. Unlike the boards from craft stores, this one does not buckle with heavy cakes and is grease proof. These cake boards are great. They are sturdy and I use them not only for half sheet cakes but also use them to arrange cookies, cupcakes and other mini cakes. Strong and durable, looks great. I have checked around, you cannot beat the price. Fits perfect with the Wilkinson 1/4 sheet cake clear display box. These grease proof boards are excellent! They keep the oily frosting from making the board look awful with grease marks. We use these for cupcakes, mini cupcakes, cupcake cakes, 1/4 sheet cakes, and shaped cakes. We even use them for round cakes when the client wishes to have details added around the cake base. I love these boards for my cakes. Perfect for a 9x13 sheet cake, or a shaped cake. Very sturdy and grease-proof. Fits great in a 10x14" box as well! great cake boards for the money,just ordered some and got them quick!! !we use webstaurant store before my suplier because of the cost, same as my supplier but cheaper and no minimum order thanks!!!! I love this pad! Very sturdy design and it looks good too! No need to worry about your cake bending and cracking on this pad. This is a great all purpose cake board. I use it for quarter sheets, or even smaller cakes with writing on the board. The white side is grease proof, and the board is sturdy. These are wonderful under my cakes and baked goods. Not only are they very sturdy, but if I goof when frosting something, they wipe right off without a trace. These work perfectly for my quarter sheet cakes. Nicely coated and sturdy enough even for a 2 layered, filled cake. Best price I have found. These boards are perfect! Exactly as described. Grease proof and sturdy, these are exactly the cake boards I needed for my cake business. Thank You! These pads are wonderful. I use them to lay my my 1/4 sheet cakes on, as well as to go underneath my mini dessert displays. I don't have a business, I just like to bake, and mostly for others. I used to send my good baking pans and just hope I got them back. Now, with these cake boards and the cake packaging from WebstaurantStore, my 9x13 cakes look professional and no one has to worry about returning anything to me. It just makes the baking that much more pleasurable. I truly love working with these 14" x 10" coated cake boards. They make cake decorating easier as you do not have to cover the board with grease resistant paper or aluminum foil. They hold up well to carrying a cake, even my specialty cakes that can be rather heavy depending on the ingredients. This coated corrugated board is sturdy, holds up to all kinds of cakes, easy to wipe and does not stain due to oil in cakes. These coated corrugated pads are the best! I have tried others and they just weren't as good as these. Thanks for making such good quality products that are very reliable each and every time I need them! I like how sturdy this is and that it has the greaseproof coating. It leaves *just* enough space to pipe a border around a 1/4 sheet cake. These are very nice boards. They are alot stronger than I expected which is great! I have used several of them with the window cake bakery boxes. This is a great board. It is the perfect quarter sheet size. The coating allows excessing to be easily wiped away, leaving no trace. It also has a great appearance, no need to cover it in decorative cello. We make "GIANT" Snowmen Cookies and place them on these wonderful coated 14" x 10" cake boards. We then package then in clear plastic 1/2 sheet cake boxes. The boards are sturdy and grease proof...no oily stains on the board makes it more appealing! I love these boards because of the coating and the size. The coating saves one from having to use a liner or wrapping the board and the size fits perfectly in the 14x10 boxes. These coated boards are perfect for my Danish braids and crispy treats! My products don't stick to the corrugated pad but also do not slide as easily as one might think! I not only use them in my production line to hold items, but also display and sell several types of baked goods on them. Will definitely be ordering again! This is a very nice board. I compared it side by side with my Wilton boards and these win hands down. The board itself is thinner than the Wilton cake board but due to the design of the Wilton board this cake board is stronger and takes more to get it to bend. This board has rounded corners instead of the square corners, but other than that I would take these boards over the Wilton boards any day of the week. In my opinion, these are a better board for a much better price. Thank you! I will be back to order more. I just love these for the coated top, where you don't have to use foil on them, It keeps the cakes very moist.Thanks you guys. These fit perfectly in the sheet cake display container. Excellent price and shipping was fast and accurate. I will definately buy these again in the future. I would prefer squared corners as opposed to rounded other than that they fit my needs well.